Three years after the DeKalb County Board of Commissioners voted to purchase the land for greenspace, a new sign has been placed at the entrance to Briarlake Forest Park. 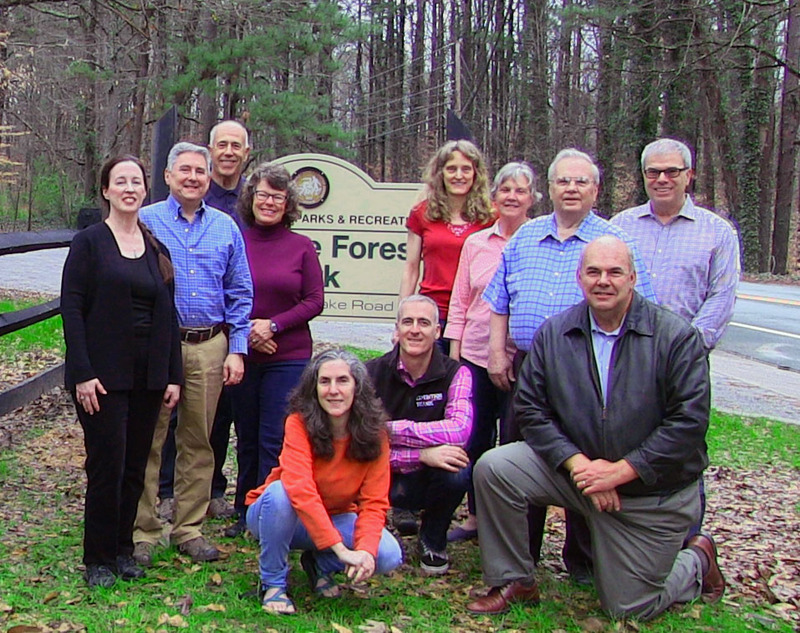 Briarlake Community Forest Alliance board members and advisors posed for a photo next to the new sign. This entry was posted in Uncategorized on February 25, 2018 by Laurie Marion. American Forests, in partnership with the U.S. Forest Service and the National Association of Regional Councils, has recently launched its Vibrant Cities Lab, an online resource that provides curated information about all aspects of urban forestry. Using the visual language of city planning websites, research showing the benefits of urban trees from many different perspectives is presented in an easy-to-read format. 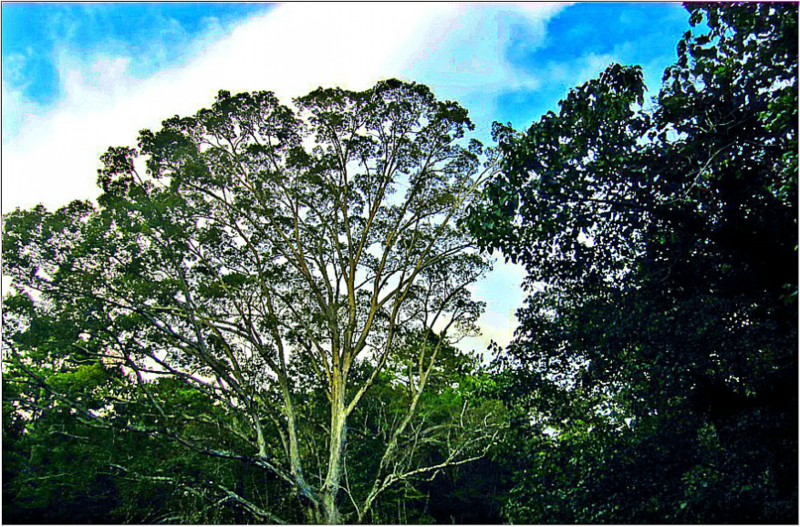 The volume of research showing the benefits of trees for public health, economic development, transportation, and many other functions of a city that urban planners work to improve, is now considered sufficient to guide decision-making. As planners seek to produce urban environments that are vibrant and provide a good quality of life for people, they can now turn to this resource to support decisions that result in the growth and maintenance of urban canopies. The Vibrant Cities Lab empowers citizen groups advocating for greenspace with an Urban Forestry Toolkit to organize information to help planners make better decisions that affect the quality of life in their neighborhoods. By providing research and easily understood video material, the Vibrant Cities Lab has framed the discourse for citizens and urban planners alike so that intelligent decisions can be made regarding management of the vital biodiversity that sustains urban life. This entry was posted in Uncategorized on October 23, 2017 by Laurie Marion. This entry was posted in Uncategorized on May 11, 2017 by Laurie Marion. 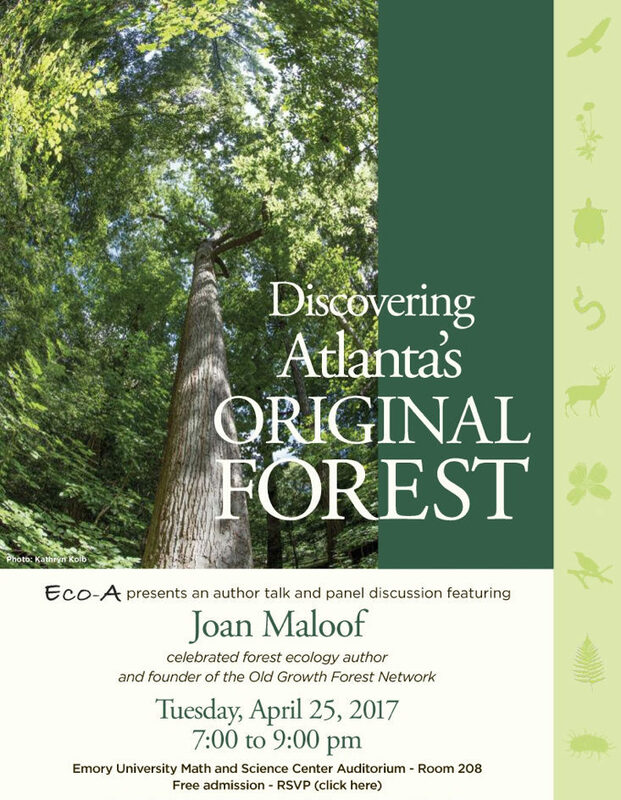 The Briarlake Forest was among several of Atlanta’s original forests inducted into the Old-Growth Forest Network on April 25, 2017 at a standing-room only event at Emory University sponsored by EcoAddendum. Coverage of the event may be viewed in the Saporta Report. Briarlake Forest, along with some other forests in the Atlanta metro area, will be inducted into the Old Growth Forest Network at an author talk and panel discussion at Emory University on Tuesday, April 25 at 7:00 p.m. Please click the image above for more information and to RSVP. This entry was posted in Uncategorized on April 15, 2017 by Laurie Marion. The Briarlake Forest has some colorful flora this time of year. 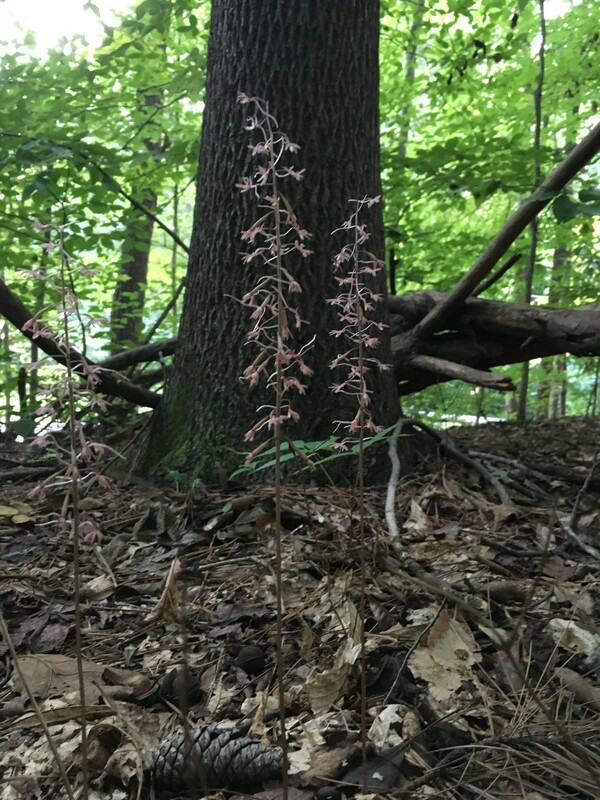 The native Cranefly orchid (Tipularia discolor) is blooming in several places in the forest, usually near a large oak tree. These orchids are native to most states east of the Mississippi, and are threatened or endangered in several states including Florida (see USDA Plants Database for more information). Some may be seen to the left of the trail leading from Castleway Lane, and a cluster of them can be seen to the left of the trail bisecting the park midway between the Castleway Lane entrance and Briarlake Road. Cranefly orchids bloom in late summer and early fall. The stalks appear only at this time. During the late fall and winter the plant shows only green leaves with purple spots. These plants thrive especially where the soil has not been disturbed, and where trees such as white oaks are well-established. They need the leaf litter and dead twigs from the oak trees to have the right nutrients to live. 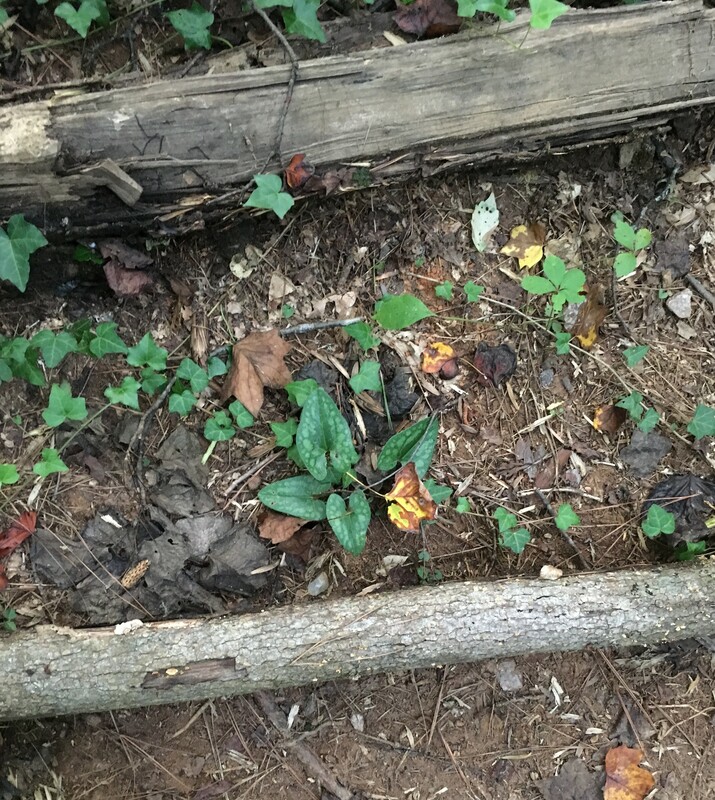 NOTE: DeKalb County Park Rules prohibit removal of any plants or plant materials from the park. Native ginger (Hexastylis arifolia) is also visible throughout the year in the park. This plant makes a flower that resembles a little brown jug. According to Walter Reeves, the seeds of this plant are distributed by ants. 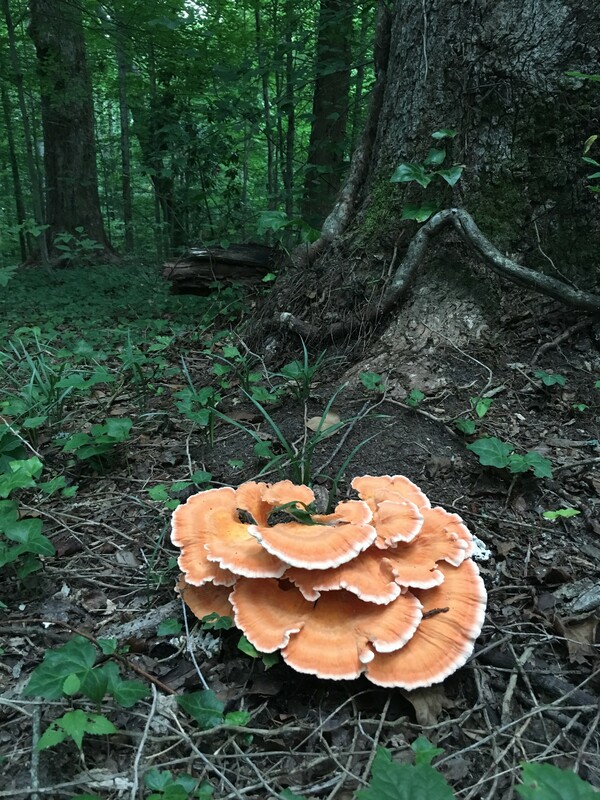 There are many other interesting plants in the forest that depend on the old-growth soil to sustain them. They will thrive best with the least disturbance to the soil possible and with careful removal of invasive species that deplete the soil of the nutrients they need. This entry was posted in Uncategorized on August 14, 2016 by Laurie Marion. In the evenings one can hear many types of birds in the neighborhoods surrounding Briarlake Forest. 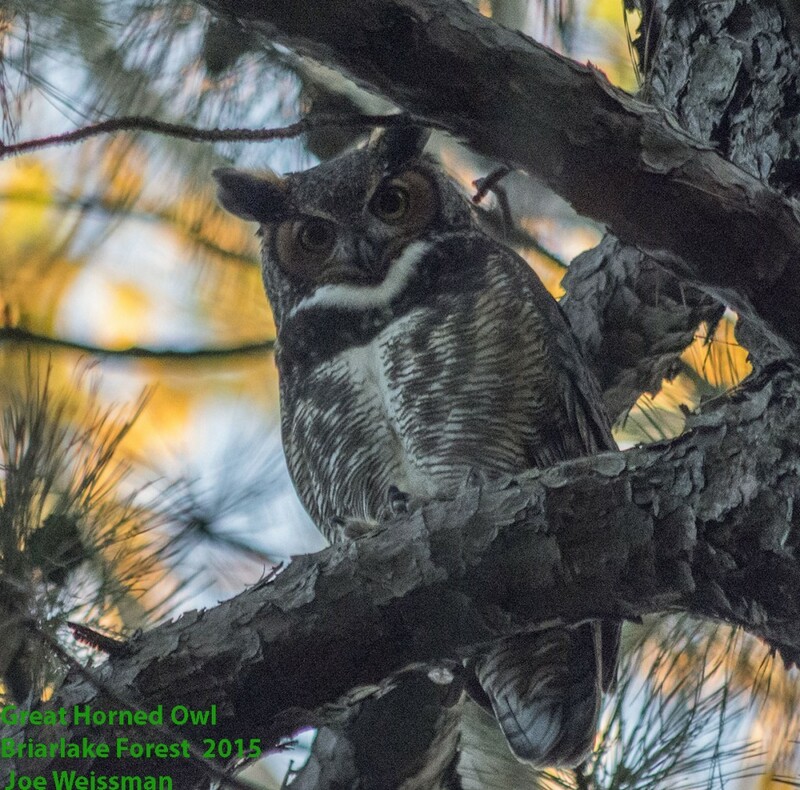 One call that stands out is the “WHOO-oo-oo, Who-Who” of a great horned owl. Joe Weissman spied this one high up in a tree using the telephoto lens on his camera. After about 15 minutes of hooting, the owl took flight and swooped over a path in the forest, perhaps to find some dinner. Voles anyone? According to the Wikipedia article on Great Horned Owls, these birds have a wingspan of between 3 and 5 feet, and weigh between 1 1/2 and 5 1/2 pounds. Naturalists also call them “tiger owls” because they seem to be the functional equivalent of tigers in the air. They hunt small mammals, birds, and the occasional reptile or amphibian, typically eating the equivalent of a couple of voles each night. Mice, rats, and rabbits are often found in the Great Horned Owl’s diet, but they sometimes hunt opossums or raccoons, and sometimes even coyote pups. 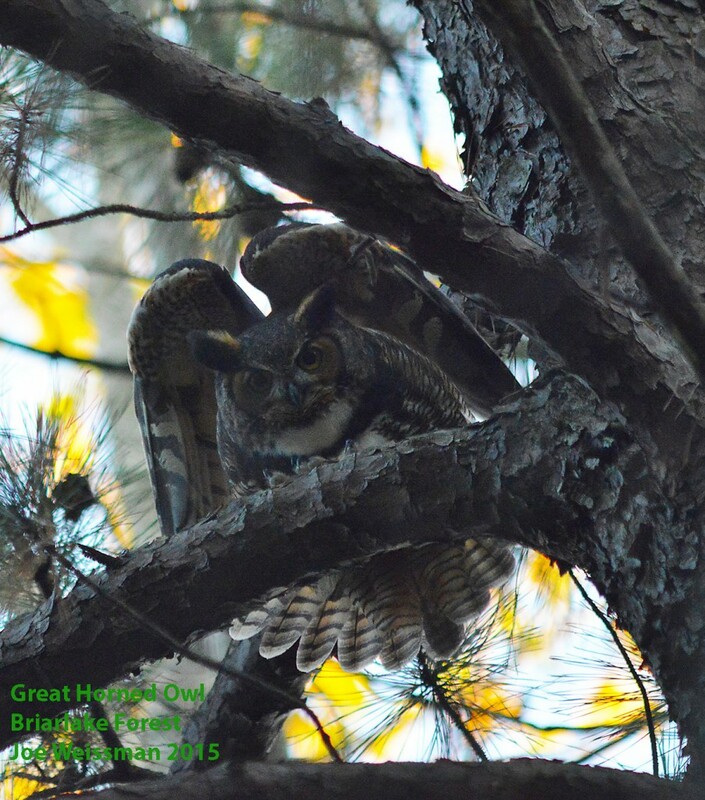 Great horned owls typically live about 13 years, though some that were studied in the wild lived 21 or 22 years, and one has been reported to have lived 38 years in captivity. They stay within about a one mile radius throughout their entire life once they have established their territory. Owls help balance the population of rodents in their area. The mystique of the owl’s call and the grace of its flight are some of the impressions that make the Briarlake Forest a special place. This entry was posted in Uncategorized on February 10, 2016 by Laurie Marion. 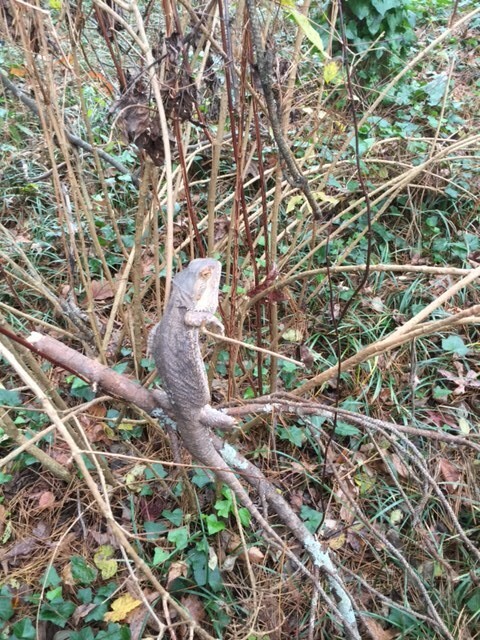 On Wednesday, December 2, 2015, around 5 p.m., Ellery McLanahan discovered an unusual guest in the forest. He posted this photo on Facebook asking if anyone knew anything about this lizard. Though I did not know much about them, I offered to help because obviously this was not the right place or climate for this type of animal. Ellery knocked on my front door around 6:30 and we went into the forest and rescued this Australian Bearded Dragon. I kept it in a cat carrier overnight in a very warm room. Fortunately, by the next morning someone who already had a terrarium and other equipment for taking care of reptiles offered to keep it until its owner claimed it. The Briarlake Forest Park was created by DeKalb County in response to people in this community exercising responsible citizenship. It is my hope that this community will show an exemplary level of responsibility towards all living things. This entry was posted in Uncategorized on December 8, 2015 by Laurie Marion. Whoo do you hear in the forest? A barred owl can be heard most evenings around 7:00 p.m. This entry was posted in Uncategorized on November 29, 2015 by Laurie Marion. The DeKalb County Department of Recreation, Parks and Cultural Affairs will hold a Park Visioning meeting at the Northlake-Barbara Loar Library, 3772 LaVista Road, Tucker, GA 30084, on Monday, November 9, 2015 from 6:30 to 7:45 p.m. This is the second meeting held by the Department of Recreation, Parks and Cultural Affairs. A draft master plan has been prepared and will be available for public review at the meeting. This process is supported by the Friends of Briarlake Forest, a volunteer group dedicated to maintaining the 21-acre urban forest. For more information or directions, the telephone number for the Northlake-Barbara Loar Library is (404) 679-4408. This entry was posted in Uncategorized on November 7, 2015 by Laurie Marion. © 2015 Briarlake Commmunity Forest Alliance, Inc.